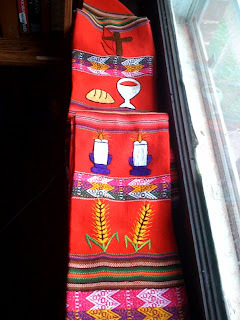 In 2006, I was given a really mean present by my former pastor: a beautiful handmade stole from Bolivia (pictured to the right). Why was that a mean gift? Clergy in the United Methodist Church are not allowed to wear stoles until they are fully ordained...and I will not be fully ordained until June 1st of this year. So for four years, the stole has hung on my wall as a reminder of what my future status could look like and I'm happy to say it will be the first stole I wear in my parish. Stoles are important vestments that change color with the liturgical seasons and thus clergy usually have at least a half-dozen or so of them. Now that I'm reaching that point in ministry where I can wear stoles, I would like recommendations! I'm not a clergy fashionista by any stretch of the imagination but would like people's recommendations of stoles they find powerful or evocative or great in their simplicity. So, are there any stoles you would recommend? If you have links to Cokesbury, Alban, or wherever sites, that is most helpful. Otherwise, just the styles or elements on the stoles would be great too! P.S. Yes, I've already seen the FSM stole...awesome but probably inappropriate! P.P.S. I would pay top dollar for a custom stole that sneaks in Star Wars elements in very subtle ways. Are you reading this, Jessica? I'm kidding!....kinda. For my ordination, my mom ordered me a stole on ebay where she sent in stoles from clergy mentors in my life and the woman used pieces from them to make me a new stole. It is totally awesome, but required a great gift from my mentors! Incidentally, there isn't actually, to my knowledge, any prohibition about stole-wearing until you are an elder. I believe it is just traditional symbolism. In fact, a stole for licensed local pastors was debated at my AC a few years ago, and had some design with JW as a circuit rider. But the current bishop has said no way to that. Anyway, I don't know of any rule actually about stole wearing..
Our OK Board of Ordained Ministry has an edict (or whatever official term it is) that non-full-connections are not allowed to wear stoles. Period! CM Almy & Sons makes beautiful products that are quite sturdy; they have something resembling a website at http://www.almy.com but your best bet is ordering a catalog from them. I like their Alta (I think) stoles: http://twitter.com/liturgicalnerds avatar pic is a closeup of the bottom detail. Anyway, check it out. Black stole for Good Friday/Maundy Thursday. A stole made from ties of my mentors. My mother made it and sewed it together. An African Stole purchased for me by members on a trip. Donald Duck and other Disneyana. 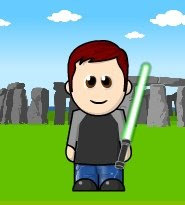 And if you manage the Star Wars stole, please share as that would be EXTREMELY AWESOME! My grandfather was an elder in the UMC, and I now have his stoles. Most of them don't mean much simply because they are nothing special, but one was hand made for him, and is pretty incredible. Also, in my conference a woman made quilted stoles for ordinands, and I love the one I got - gorgeous read. I have another hand-made one from a mission trip to central Asia. When I was a probationary elder serving as an associate pastor, my senior pastor told me to go ahead and wear a stole. I thought it was only for ordained clergy, but obviously I followed his instructions. I have a whole passel of vestments artists and examples of their work in the Vestments/Clericals archives at www.beautytipsforministers.com. Your stole is GORGEOUS! Hey Jeremy--- Here's a link to a wonderful place to shop for stoles. I have received one of these, and given one as well. These are Rwandan stoles, and the company employs women in need. That has made my stole so very special to me, outside of the wonderful folks who gifted me. All the best to you as you are ordained! Sorry I don't have any Star Wars possibilities.